Innovating a new cell design that combines the best that tubular and flat-plate have to offer. 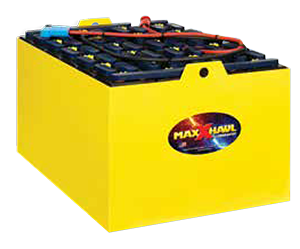 The Best of ‘Both’ Worlds – MAX-HAUL delivers the reliability and tough, long-lasting performance of traditional flat-plate batteries…with the higher capacity and cycle performance claimed by tubular plate batteries. With four years of engineering development and extensive testing, the MAX-HAUL design outperformed similar high-capacity tubular batteries in side-by-side field trials. In very tough conditions it ran longer and cooler than the competition – which means more production and longer life. MAX-HAUL by Crown. The world’s new “super-power” in industrial batteries for material handling equipment. Some tubular batteries claim a “special effect” that offers more power and longer running time than flat plate batteries. MAX-HAUL’s 3P design puts that claim on notice – with a new Plate design, new Paste (active material) and a new Process. This innovative MAX-HAUL product design delivers the benefits of both traditional flat-plate and tubular designs. Crown Battery has a reputation for working closely with independent agents, OEM’s and equipment operators to ensure that batteries meet and exceed performance expectations. With a proven track record for battery productivity and life, Crown’s batteries are the materials handling industry’s first and best choice for motive power. GET the MAX!